At our current location in Washington Harbor we are just close enough to Pennsylvania that my parents, Steve and Sally, could drive for a visit. That’s just what they did! My Aunt Mari and Uncle Bob came along too. We were thrilled to see family as it may be quite a long time before seeing one another again, at least in person. Thanks to modern technology we do stay in close touch via email, Facebook, and can use Skype for an interactive phone call. The Wasylyks arrived late on Friday evening. Since we were wining and dining with Glenn, we planned to meet them on Saturday morning. What a day! We awoke before the sun and had breakfast with Glenn. He then drove us back to Washington DC; provided a nice tour along the way pointing out the Washington Nationals Stadium and his office building. We made a stop at the Capital Yacht Club for a mail check, Serendipity was awaiting a package, then delivered the package on our way to the boat for a quick change of clothes. Glenn navigated around a road race that was blocking what seemed like the entire city. Hugs to Glenn! We set off into the Capital Hilton to greet my family who was astonished we’d arrived by 9:00am. Fortunately we were blessed with a beautiful, sunny day that was just a tad on the chilly side. We had lots of walking to do to see our intended sights. On our way outside, Sally stopped by the car and gave us a brief rundown of our care packages: jerry cans, baby wipes, mail, new clothes, homemade soup and brownies, and Rickard’s fresh apple cider. We should get together more often! Everything was safely stowed in the car for the day, which by the way had not yet been parked for the $38/day fee. Steve had some words with the attendant, not pleased that he was paying for the car to be sitting alongside the curb. “We’ll take care of it…” and we were off to see the sights. 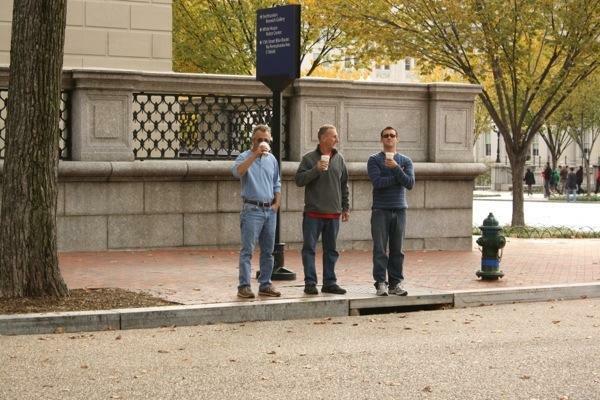 Starbucks was essential, and there were several along our walk to the National Mall. We circled the WWII Monument. Aunt Mari successfully located the Pennsylvania pillar. 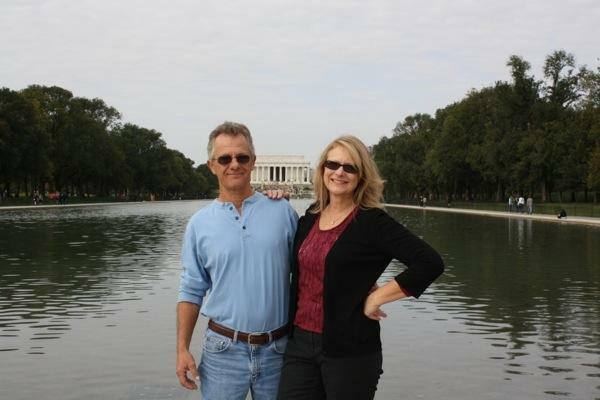 At the Reflecting Pool (which wasn’t doing much reflecting with it’s brown, murky water) we paused for a photo shoot. 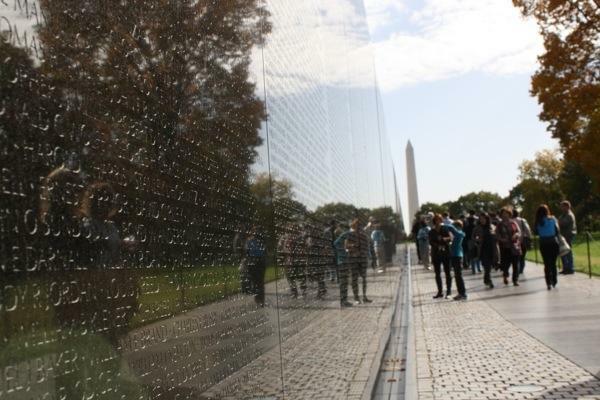 Then we moved on to the Vietnam Memorial Wall. We were nearly famished after a long morning of walking. We stopped at the Old Post Office to get some lunch. Next was to visit the Smithsonian Air and Space Museum. We could have spent the entire day in Air and Space, there was so much to learn! 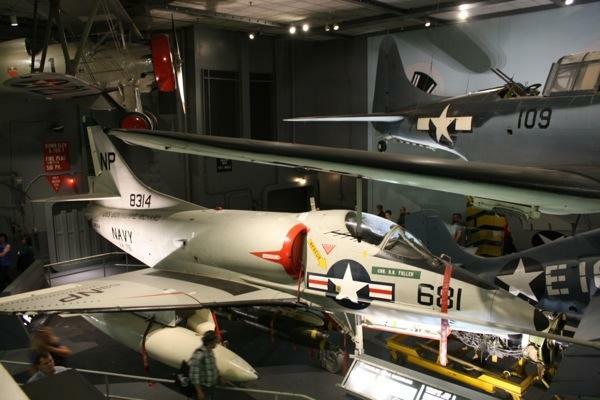 The exhibits were wonderful and all the planes and spacecraft displayed was daunting. Steve and Uncle Bob checked out the flight simulator. With Steve piloting and Bob firing, they got five kills earning the rank of “Ace.” We walked through several exhibits. Sally’s pick was the Discovery; still in progress. Uncle Bob gave us a lesson in morse code which he remembered from his Navy days. Brian’s pick was the Wright Brothers. 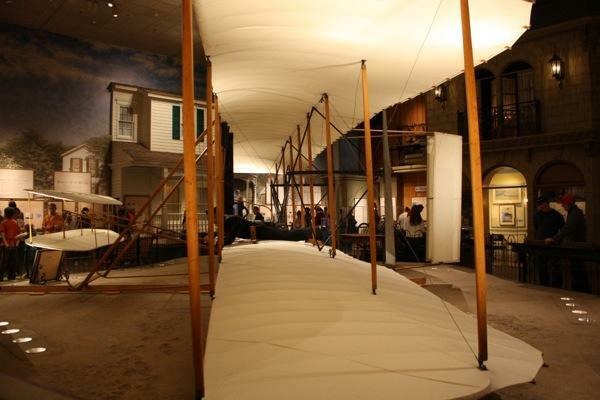 We were surprised the plane on display was the actual Wright Brothers’ plane, only the fabric had been replaced since the original (also on display) had deteriorated so badly. 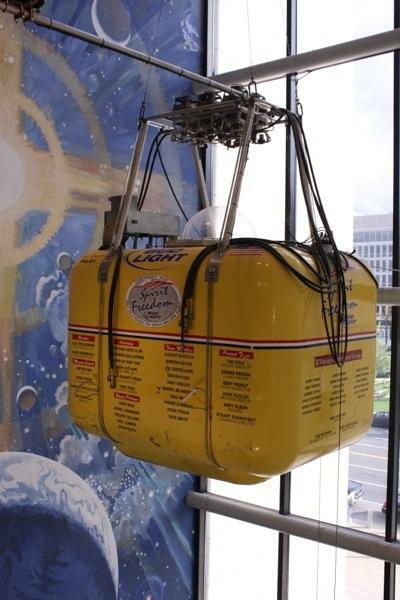 I found this hot air balloon that successfully circumnavigated the globe in 2002. Sheesh! If someone can live in that little balloon I surely shouldn’t have any problems on our 32′ yacht! 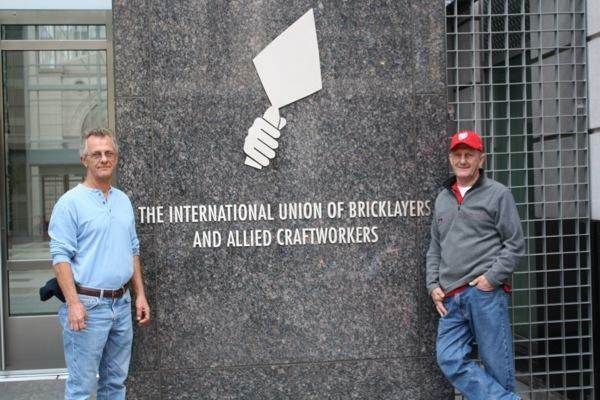 On our walk back toward the Capital Hilton, Uncle Bob spotted the International Union of Bricklayers and thought it to be a very appropriate photo opportunity. Later that evening my family took us out for a delicious meal. 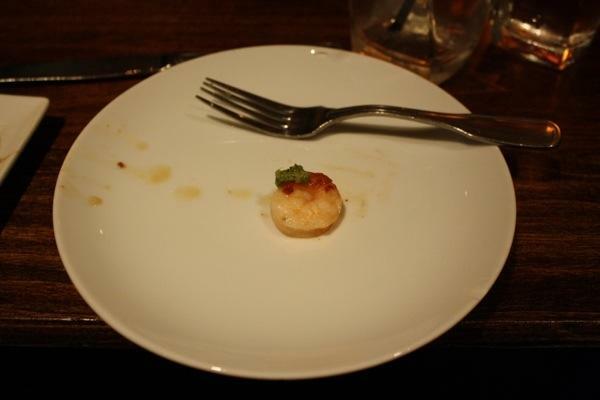 Good thing all those museums and monuments are free because dining in DC sure isn’t! Just kidding! We did have a really great dinner, paired with sangria, at a tapas resturant that we found on our walk back toward the hotel. We tucked in the family and headed back to the boat to get some much needed shut-eye. 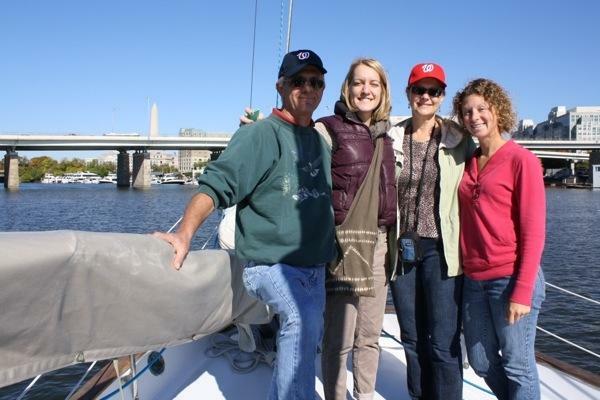 On Sunday morning my family met us at the Capital Yacht Club. Sally and Aunt Mari helped me in the kitchen to prepare breakfast for everyone while the guys schmoozed with fellow cruisers. Wow, cooking on a full size stove…a microwave…a sink with running, hot water! Making breakfast was a breeze! We ate in the club’s lounge and were joined by my cousin, Colleen. After our meal we headed to Rode Trip for boat tours. 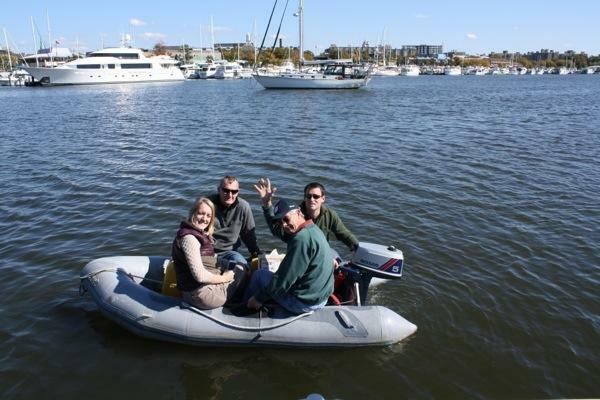 Thank goodness everyone survived the dinghy ride! All of our care package necessities also made it safely aboard. The Wasylyks had a long drive ahead, Colleen was headed home to study, and we planned to jump 10-miles down the river to Mount Vernon before sunset. 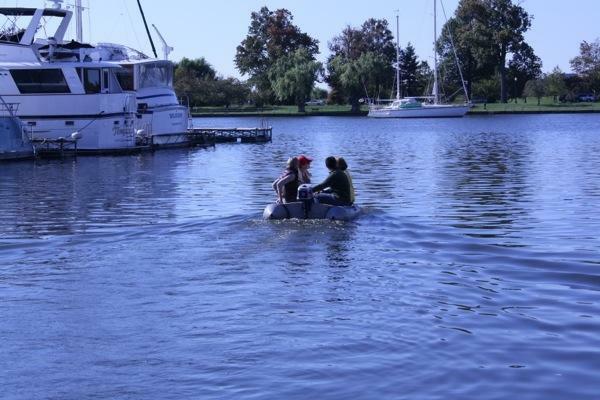 Brian dinghied everyone back to shore. Oh, and that $38/day valet parking fee, thanks to Steve’s persistence about the car not actually being parked (it sat on that curb in front of the hotel all weekend) they were only charged for one day. It was so good to see everyone! Hi, I just got back from DC. Missed you by a day! I was there for work. 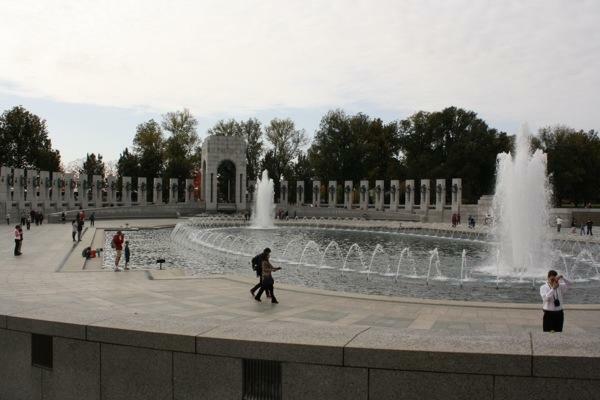 I got to see the WWII memorial also. I hope some day we can stop building memorials to war because there will be no more wars….Sorry I missed you, but I enjoyed telling your story to my colleagues. Be safe!